This study examines how people value their historic urban landscapes through participatory heritage websites. These websites are online places where citizens actively contribute to the conservation of urban heritage. Taking UNESCO’s 2011 Recommendation on the Historic Urban Landscape as its theoretical starting point, this study understands urban landscapes as (1) dynamic, because they change over time; (2) multilayered, as different generations and communities contribute in diverse ways to the development of urban landscapes; and (3) mediated through digital technologies such as participatory heritage websites. Furthermore, this UNESCO recommendation is used to make a distinction between the kinds of heritage discussed on the websites (attributes) and the significance attached to it (values). 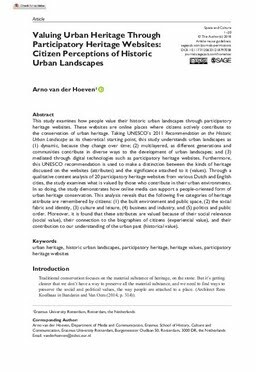 Through a qualitative content analysis of 20 participatory heritage websites from various Dutch and English cities, the study examines what is valued by those who contribute in their urban environments. In so doing, the study demonstrates how online media can support a people-oriented form of urban heritage conservation. This analysis reveals that the following five categories of heritage attribute are remembered by citizens: (1) the built environment and public space, (2) the social fabric and identity, (3) culture and leisure, (4) business and industry, and (5) politics and public order. Moreover, it is found that these attributes are valued because of their social relevance (social value), their connection to the biographies of citizens (experiential value), and their contribution to our understanding of the urban past (historical value).